I just figured out that I am Google's Blog of Note today. I was thinking, "Why the cuss are all these people coming to my site today?" I thought it was some spam thing. Anyway, after my realization I felt guilty that I didn't have anything more recent than my scratch-built tavern post from over a 2 weeks ago. I've been way busy with work and with Thanksgiving / Christmas goings-on, so I haven't been painting any models. However, I'd say this little project is appropriate. 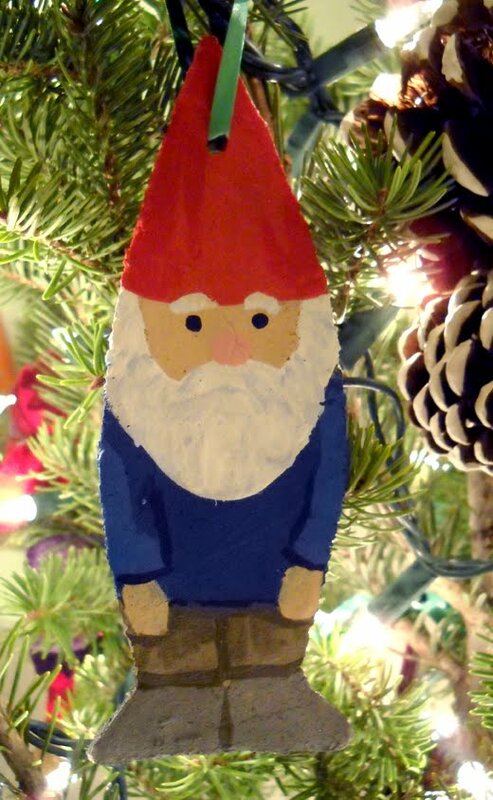 A couple days ago my daughters and I painted up 12 salt dough nisse ornaments. A "nisse" is basically a Danish Christmas gnome, although the tradition goes back to pre-Christian times. He is known as a "tomten" in Sweden. The author of Pippi Longstocking wrote a couple books about them. I painted a 20mm metal nisse last year. Our ornament is hand-made baked dough. My wife developed a gluten free salt dough recipe. I made a cardboard template which we used to carve out the nisse shapes. We baked them, and my daughters and I painted them. It's not my usual model-making post, but the skill set is the same. 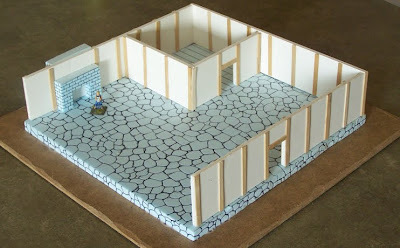 Last week I started building a tavern for my 28mm villager models. She's not interested in gaming, but I think my 7-yr-old daughter and I will like playing with this "doll house." The top and front will remain open to allow access to the rooms (although I am leaving space for a possible front wall in the future). 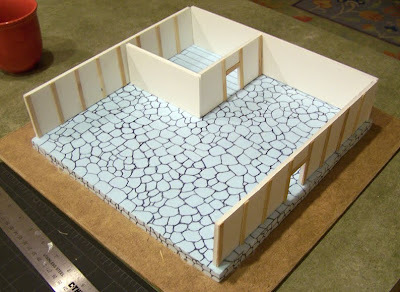 I'll scratch-build a bar, but I think we'll be buying metal 28mm furniture, barrels, etc. from Mega Miniatures. 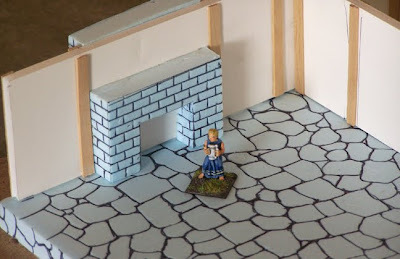 I already own a 28mm Medieval/Fantasy barkeep, inn keeper, cook waitresses, drinking patrons, etc. Apart from the hardboard base, the materials have all been free! I picked up a discarded blue insulation sheet from a home renovation a few years ago (I drew in flagstones with a pen to create indentations for when I paint). Knowing that my family is craftsy, my neighbor gave us a few unwanted sheets of foam board. The half-timbers are stir sticks from a coffee shop. I have been collecting these stir sticks whenever we go out for coffee. I pocket the sticks after use instead of throwing it in the trash! Obviously, this takes a good while to build up enough materials. Re-using this garbage is good for the environment too! I have been measuring and cutting all the complicated pieces ahead of time, and my daughter will helped glue and assemble. We'll be painting the finished construction together. Check this out: When I cut out the whole for the door it was randomly the right width for 5 stir sticks! So, the door fits perfectly. I'm thinking about how to handle the windows. Either I'll do something complicated with cut holes and plastic "glass," or I'll just glue on a bunch of closed shutters. 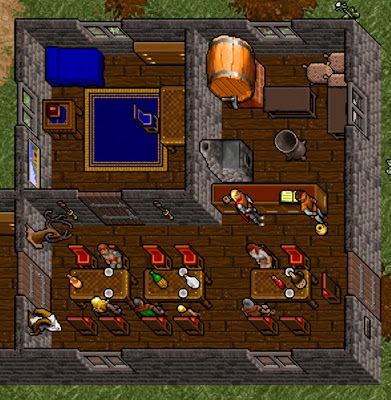 The inspiration for the floor plan comes from an old PC game, Ultima VII. "The Modest Damsel" on the island of New Magincia had a simple square layout I like. You can see from this screenshot where I will be placing the bar. The bedroom in this image can also be a store room in my model.